Summer heat is unbearable and makes me want to go to the south pole! Not literally south pole but Southpole Central Hotel instead. Blogging is easy-breezy when I just got back from a trip and I need to take advantage of it. My room, which is only ventilated by a 3-year old desk fan, isn’t conducive for writing. The sweltering summer heat hinders the natural flow of brain juices. The urge to find a room for a weekend led me to Southpole Central Hotel when someone from the hotel invited me for a stay. I don’t frequent downtown Cebu so considering the location of the hotel in Junquera Streets was a nice idea to check activities within the area. Southpole Central Hotel’s Chill Out Bar. 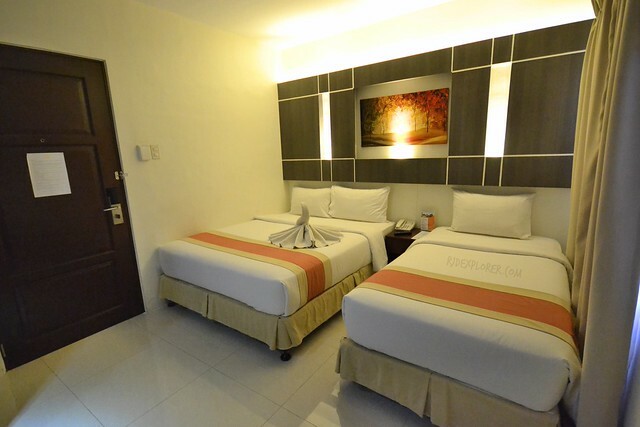 Location wise, the hotel is very accessible to South Bus Terminal perfect for travelers planning to do canyoneering and waterfall hopping in the south. The hotel shares a street with the historic University of San Carlos main campus. Colon Street, the oldest road in the country, is just 2 blocks away from the property. 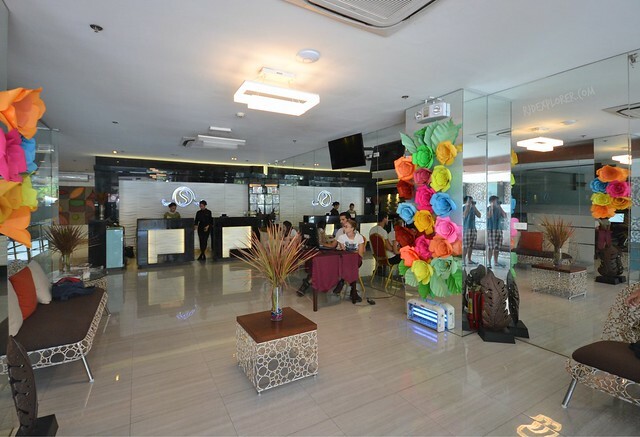 Southpole Central Hotel’s lobby and front-desk. Ground floor is the receiving area and in-house cafe. Guests usually get a welcome drink after checking-in. They’re not a big hotel yet a staff ushered me to my room. Elevator has a key-card access that only allows you to tap the button of your assigned floor, apart from the common floors. Southpole Central Hotel has three room types: superior, deluxe, and business suites. Except for superior that can accommodate up to three persons, the other types are only good for 2. For the beds, all rooms have 2 beds and could be combinations of queen or single beds. 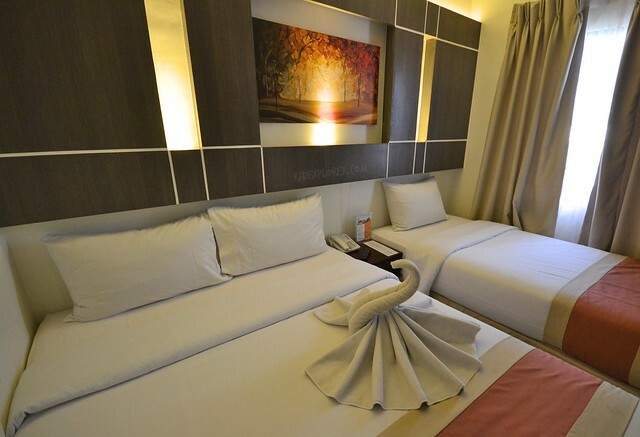 Southpole Central Hotel’s superior room. Fully air-conditioned superior room offers basic amenities like a 32″ LCD cable television, open closet, telephone, and a working desk. Added perks include bottled mineral waters, room slippers, and towel folded into cute origamis. What’s obvious on the interior of the room is the good amount of space to move freely. The way they arranged the closet, full-length mirror, and desk adjacent with each other provided an ample space for guests. Hot and cold shower is available and a bidet is a luxury for everyone. Basic shower essentials like shampoo, bath soap, vanity kit, and dental kit solve your dilemma of not bringing your toiletries. To top all these perks is the free connection on their high-speed fiber internet up to 50Mbps. The supposed time for catching up with backlogs turned to a restful stay. With the erratic weather; hot and humid during the day and rainy and cold during nighttime, I got a severe cough and colds on my stay at the hotel. I felt the comforts of cuddling with my blanket and staying away from the extreme weather. I noticed that I left my medicine pouch at home. Good thing, a pharmacy is just a block away from the hotel. There’s also a convenience store right on their doorstep. 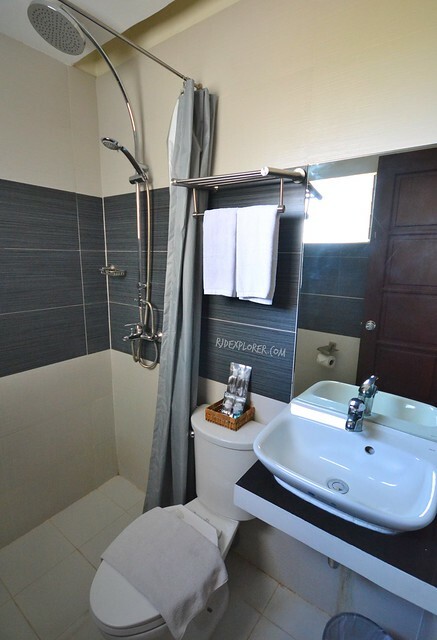 Toilet and bath equipped with hot and cold shower, bidet, and shower essentials. The restaurant on the ground level offers all-day dining with several selections. Sizzlers, Filipino a la carte meals, burger and sandwich, appetizers, pasta and noodles, and salad. Sizzlers range from Php110 to 150 served with rice and a glass of iced tea. 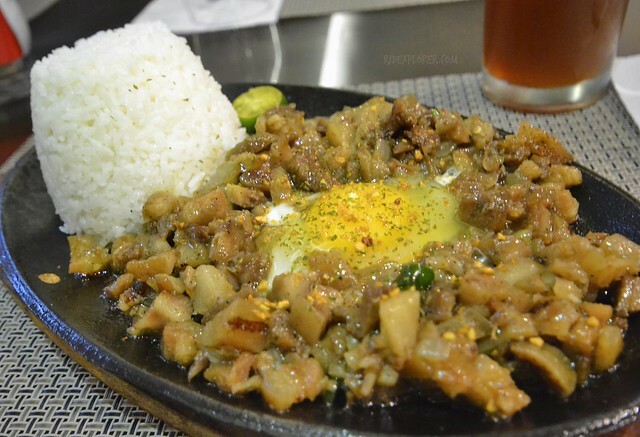 Since it was a fine evening for some sizzler, I got a plate of pork sisig. It’s basically grilled pork head and liver chopped into pieces seasoned with chili and calamansi. Their version of pork sisig left me hanging and searching for more flavors, probably the saltiness and more kick of chilis. Texture is quite good, in between crunchy and soggy. Free cocktails at the Chill Out Bar. 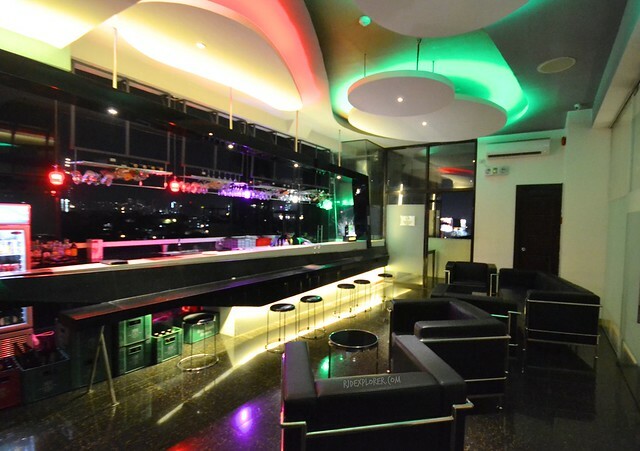 On the topmost floor of the hotel is their Chill Out Bar with one of the windows framing the cityscape. 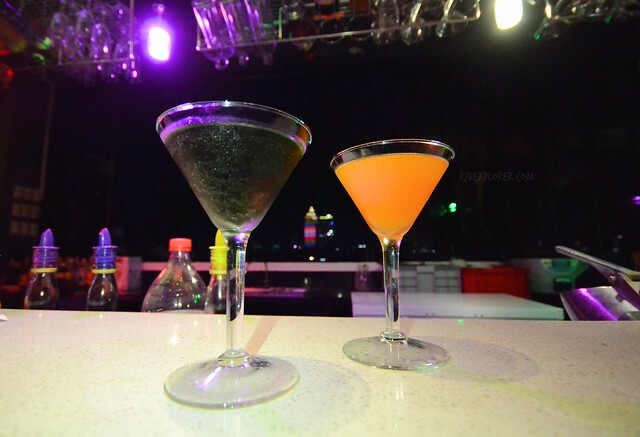 Drinks are not limited to gin, tequila, vodka, rum, whiskey, local beers, and cocktails. For appetizers, the usual chips, fries, and fried items are up for grabs. By the way, room rates include two free cocktails of your choice. I forgot to ask the cocktails served by the bartender but rum is evident on both drinks. On the same floor is their function hall. For breakfast, yes it’s also free, it can be availed on a function room at the rear side of their restaurant. Breads, fruits, viands like sautéed veggies, sausages, tocino, and eggs. 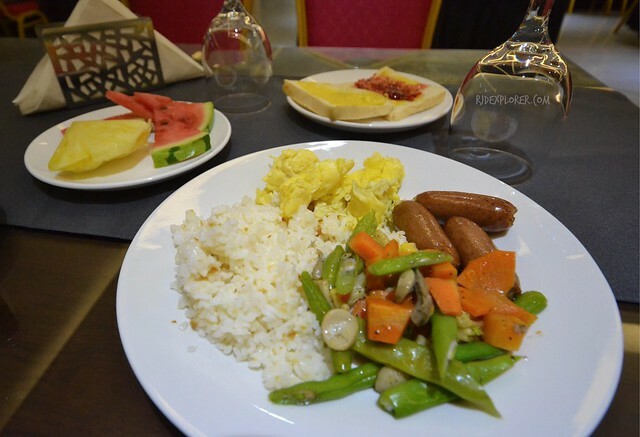 Breakfast spread and options are not that impressive yet it’s already filling to start a new day of exploring Cebu. 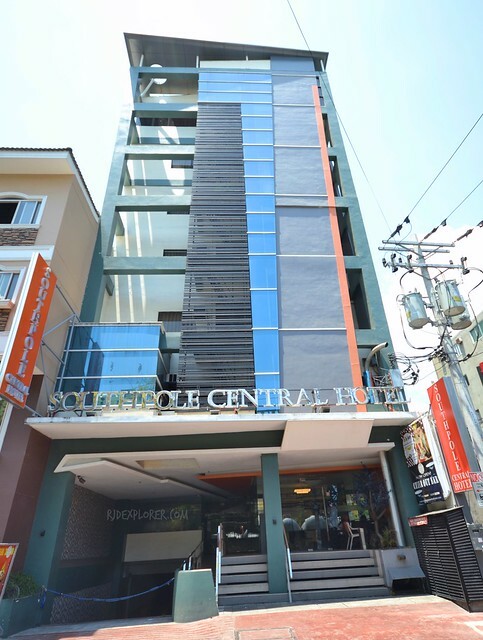 Southpole Central Hotel is a nice choice for travelers, leisure or business, visiting the queen city of the south. The 95 guest-rooms ensure value for money because of its facilities and amenities while their friendly working crew define good service. For locals, Southpole Central Hotel is also an acceptable option for a summer staycation away from the stifling weather. Disclosure: Thanks to Southpole Central Hotel for inviting me for the purpose of hotel review. All opinions stated on this post are my own.